While 5G brings promises of cutting-edge services, more basic network improvements will likely arrive sooner, reveals talks and presentations at this year's Consumer Electronics Show. In the near-term at least, much of the value provided by 5G won't come from the types of apps and services that have been hyped to the moon. Talk to some of the tech and telecom companies heavily promoting 5G, and they'll spin tales of how the technology will do things such as stream VR content at a 4K or higher resolution, shuffle gigabytes of data per day between self-driving cars and cloud servers and support last-mile Internet connections for tens of millions of homes and businesses. Over the long run, 5G might indeed be widely used for some of these applications (though maybe not so much for VR streaming, since VR headsets are typically used in places where non-mobile Internet connections are available). But after talking with industry execs at the Consumer Electronics Show (CES) and checking out 5G demos and tracking the week's 5G-related announcements, it feels as if many of the benefits delivered by 5G over at least the next couple of years will involve more mundane, but still useful, technical advances. 5G's latency improvements relative to 4G -- brought up both by AT&T's (T - Get Report) Internet of Things chief Chris Penrose and Verizon Wireless (VZ - Get Report) chief Ronan Dunne during talks -- are among those advances. A major drop in network latency -- defined as the minimum amount of time needed for a bit of data to move from one point on a network to another -- benefits services running the gamut from video calls and cloud gaming to IoT sensors and factory systems that need to share information with a server with little or no lag. As a hypothetical, Dunne suggested that Verizon could tailor service packages to consumers and business verticals that take full advantage of 5G's low latency or high download speeds or both (as an aside, the end of net neutrality makes launching such offerings easier). A service package meant for gamers was one of the ideas brought up. Another 5G benefit getting attention: Its ability to improve connection speeds and relieve congestion in situations where 4G network quality isn't ideal. Or, in other words, 5G's handling of services that 4G doesn't have much trouble with when a user is reasonably close to a base station and there isn't too much network traffic, but could struggle with when one or both of those conditions aren't met. Qualcomm (QCOM - Get Report) , whose modems are set to power most of the 5G phones launching this year, highlighted this benefit in demos that showed a 5G network performing much better than a 4G counterpart at streaming video and downloading files in less-than-perfect conditions. Dunne, meanwhile, suggested that rush-hour Manhattan is the type of urban environment where 5G, aided by its support for short-range, high-frequency, mmWave spectrum, could do much to improve service quality. And though it remains to be seen just how common this use case is, there seems to be interest in using 5G networks (thanks to both their low latency and higher connection speeds) to offload more data-processing from IoT devices to cloud servers (possibly ones sitting at the network edge). In theory, that would allow IoT devices to pack less powerful processors and batteries than are necessary for devices using existing radio technologies such as LTE-M and LoRaWAN. 5G's long-term potential to make good on some of the flashier use cases being advertised still bears watching. This especially holds for 5G's last-mile broadband potential in a place such as the U.S., whose domestic broadband market features some of the highest average prices in the developed world and is dominated by service providers with pretty low customer satisfaction ratings. And in the U.S. and elsewhere, a recent test in which Ericsson (ERIC - Get Report) and Deutsche Telekom shuffled data at 40Gbps using a mmWave wireless backhaul link is promising, since it raises the possibility that a portion of the 5G base stations supporting home broadband won't need fiber to backhaul their data. When asked about Verizon's 5G fixed broadband ambitions, Dunne insisted his company's goal of eventually making fixed 5G services available to 30 million homes could (in spite of the skepticism that some have shown towards that target) end up proving conservative, as hardware improves and Verizon fully deploys the 1,000 MHz of spectrum it has available for 5G. He also suggested that many of the customers for the initial 5G home broadband launch Verizon carried out in October are seeing typical download speeds well above the 300Mbps that Verizon promised. 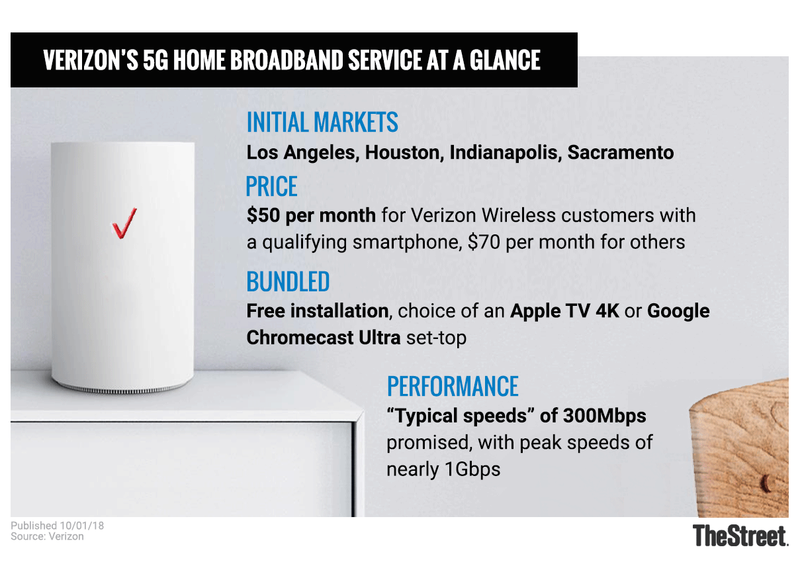 However, it's worth keeping in mind that Verizon is only promising to cover 30 million homes within a "few years," and that its initial launch is both limited in scope and for now relies on a proprietary 5G standard. Relative to mobile services, making 5G fixed-broadband services available on a large scale will take a little while even if some lingering technical questions are addressed. In the meantime, look for 5G networks to deliver nuts-and-bolts improvements for consumer and business services that are available in some form today.